My young friend Ahmad Umair has some business along the Ravi south of Lahore where he frequently travels on roads that are not on the itinerary of most travellers. One day he mentioned a place called Sarai Mughal outside which he had seen a domed building. A couple of years earlier, I had been to Sarai Chhimba, near Jambar about thirty kilometres southwest of Thokar Niaz Beg and just off N-5. Talking at that time to my guru, the preeminent archaeologist Dr Saifur Rahman Dar, I was reminded that there were once upon a time inns at convenient intervals along all major intercity roads. In those days of travel either on foot or by horse or even bullock cart, a convenient distance for a day’s journey was ten kos or between thirty to forty-five kilometres. Looking out of the aircraft window while coming in for a landing at Muscat International Airport, in 2005, one notices the rugged hills of the Al-Hajjar Range that are in stark contrast to the undulating sand dunes that welcome a visitor to the other Gulf countries. As if the hills stand in as the Nature’s high-rise structures in Muscat, there seems no need for the gross man-made skyscrapers that mar the skylines of many other cities in the Gulf. 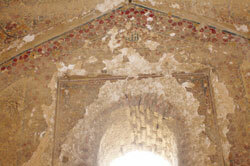 Now, Multan has long been the first city in our part of Punjab since the early Middle Ages. Lahore, in comparison was a minor provincial town. That having been said, the modern darling of Punjab was gradually coming into its own by the 17thcentury. For the Mughals, both Lahore and Multan were important centres for many reasons, not least of which was revenue collection. And so there existed between the cities a good deal of two-way traffic. That warranted the string of inns between the two cities. But Umair was certain that there was no inn. His ramblings in the area had uncovered only the domed building standing forlorn amid a graveyard. And so, with Umair playing guide, we drove off down Multan Road to Balloki village via Bhai Pheru. From the latter we continued south along the road to Halla and at about ten kilometres from Balloki went through the village called Sarai Mughal. In that same way, I felt, the men thought we sought the sarai to perhaps be put up for the night. There was no sarai, they said. An older man later informed us that he remembered ruins of a sarai that have now been built over. Other than that he could tell us nothing. 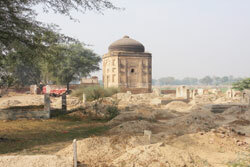 But of course, he added, there was the old Mughal tomb just outside the village. This was the very one that Umair had explored on his travels. A little outside the village, by a government school, and surrounded by a graveyard there stood the lofty building with its squat dome. Other than the lime plaster eroded from the plinth and in patches from one side, the building was in good fettle. In fact, if the plaster on the dome had not been blackened by age, I could have said it had been laid only a few years earlier. In my layman’s estimation the building dated to the last quarter of the 16th century, that is, the final years of the reign of Akbar the Great. The interior of the square building had a bare floor: there was no burial. 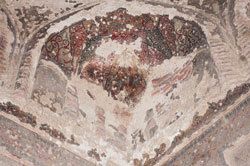 But the walls were ornate with Mughal-style frescoes. Faded, discoloured and chipped, they had also been marred by cow dung patties. Earlier, Umair and I had scouted around for the entrance to the basement burial chamber outside but had found no trace of it. We concluded that though it had been erected as a funerary monument for some passing nobleman (or someone close to him), the interment had actually not taken place. A young man, who lived next door and whose family plastered the walls of this historic building with cow dung and also used it to pen the cattle, came around to talk to us. No one, he affirmed, was buried in the building. Nor too had stories been invented about the holy personage who will without doubt one day miraculously be discovered to have been buried within “since the time of the grandfathers”. He will grant wishes and acquire a following and some charlatan will enrich himself with the offerings the tomb will receive. Talk turned to the disappeared sarai. I have seen in Sarai Chhimba as well as in Rajo Pind (the sarai outside Rohtas Fort) that people have destroyed the old building to use the bricks for their homes. The process continues as ignorant people destroy priceless pieces of our built heritage that successive corrupt governments are simply not interested in preserving. My mind flew to the Jahangir period caravan-serai near my ancestral village Uggi in Jalandhar district. In 2010, the government of India was wrapping up an extensive restoration project on it. This building was comparable with our own Sarai Chhimba, being of about the same antiquity and equal grandeur. But here in Pakistan, we permit people to lay waste what heritage we have. Shame on us that we have lost Sarai Mughal. Low-rise buildings in pastel hues and beautiful mosques with domes in sparkling colours are the features of Muscat architecture. The sooner one alights from the aircraft; the locals appear different too, with their neatly wound, multi-coloured turbans which seem much more utilitarian, compared to the rope-and-tassel affairs in the rest of the Arabian Peninsula. In Muscat, one finds the western tourists as well as expatriates respecting traditions by way of their own sensible dress and general conduct, quite in contrast to some other Gulf cities. The arrival of our armed forces delegation was known to the Pakistani community, whose representatives had organised a dinner on the very first evening at a local hotel. At dinner, we were invited yet again to spend the following Friday at the farm of a Pakistani, Haji Abdul Yusuf. Yusuf had moved to Muscat three decades earlier during the oil boom. An enterprising gentleman, he fell in love with Oman and decided to live here forever. Following up on a government initiative, he purchased some barren land about an hour’s drive from Muscat, where irrigation water had been facilitated by the government. Bringing in labour from his village in Pakistan, he started tilling the land and today, his farm is one of the largest, completely mechanised farms in Oman. A sumptuous lunch featuring a Punjabi fare was the highlight of the visit to Haji sahib’s farm. Making use of the weekend, we visited the Sultan Qaboos Grand Mosque which is an architectural masterpiece, with some stunning decorative features on the inside. The dome is of a unique filigreed design, with matching cavernous minarets. Inside the prayer hall, the chandelier is of superlative dimensions, being 14 metres tall, with over 1,000 bulbs and 6,000 crystal pieces, surely giving sparkle and glitter a new meaning. 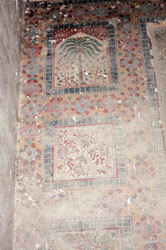 The carpet inside the hall is said to be the second largest single piece and was woven in Iran. In a sign of the times, some of our compatriots preferred to pray in the hotel, rather than follow the imam of the dominant Ibadi sect, which has some doctrinal differences with those of Sunni as well as Shias. The next day, after the official proceedings were over, we were taken to the Al-Jalali Fort by a motor boat. After disembarking at the quayside, we climbed a series of steps that brought us atop the fort, which afforded an immensely pleasing view of Muscat harbour and the serene waters of the Gulf. 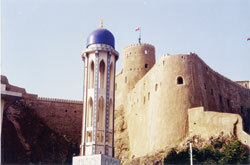 The fort was built by the Portuguese shortly after Afonso de Albuquerque conquered Muscat in 1507. Two partially successful attempts were made by the Ottomans to wrest control of Muscat. It was finally captured by the local Imam of Oman, forcing the Portuguese to finally surrender in 1650. In the fashion of all colonial powers, the Portuguese too committed their share of pillage and atrocities during their rule. The underground dungeons of the fort were evidently witness to the cruelties perpetrated, and we were told that anyone who went in never came out alive. We tested one of the dark dungeons, but mercifully, not only did we emerge unscathed, we found ourselves on a beautiful beach after opening a recently installed door, as if in a dream. The renovated fort now serves as a cultural showpiece for visiting dignitaries and, we were duly accorded the honour of a sumptuous lunch in the presence of our Omani armed forces counterparts. A visit to the Sultan’s Armed Forces Museum was instructive and one could note the emphasis on preserving Omani traditions, particularly in uniforms and military livery. An evening fete in the Central Armed Forces Officers’ Mess was again an impressive function, where waiters in splendid Omani thobes, complete with badges and other regalia, and well-versed in military decorum, served us in traditional style. With the oil drying up, trying to keep up with the Gulf Joneses has been difficult for Oman. All other Gulf capitals have the Corniche, the paved pathways on the waterfronts, and Muscat is no exception, having built a beautiful one on the adjoining Muttrah Bay. Similarly, luxury hotels are de rigueur for the rich tourists and Muscat has not been left behind. One of the most impressive that we got to see is the Al Bustan Palace belonging to the Ritz-Carlton group. The grand hotel was built in 1985 to house delegates to the GCC summit conference and Oman spared no effort to not be singled out as the ‘country cousin’ of the other Gulf countries. The hotel is a place worth visiting and is highly recommended at least for a coffee, if not for a night’s stay that could leave you lesser by 1,000 Omani Riyals! Of all my travels in the Gulf cities, I liked Muscat the most, in part for its well-preserved past and, for the fact that its architecture blends with the natural surroundings without being an eyesore. Beautiful mosques, open air souks, traditional dhows bobbing in the placid harbour, flower-laden gardens and palm groves, and turbaned men with daggers in their belts, all conjure up images from One Thousand and One Nights. 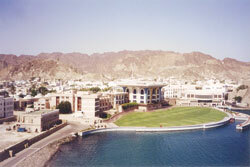 If one were to look for the jewel of the Arabian Gulf, one need not go farther than Muscat. A bird’s eye view of Muscat, with the Sultan’s palace in centre.